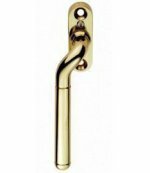 Solid unlacquered brass narrow style window espag handle which fits on any type of window, including upvc, timber and aluminium. They have a 7mm fixed spindle (spindle comes with 35mm length showing) and can be locked by way of a grub screw hidden under the handle. Supplied with necessary fixing screws. (Picture shows right hand handle). 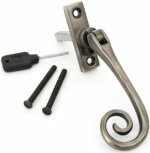 Antique pewter narrow style window espag handle which fits on any type of window, including upvc, timber and aluminium. Supplied with necessary fixing screws. (Picture shows left hand handle). 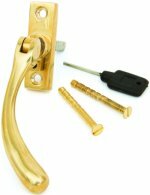 Peardrop narrow style window espag handle which fits on any type of window, including upvc, timber and aluminium. Available in Unlacquered Brass, Polished Chrome, Satin Chrome & Antique Pewter. Available in Polished Brass, Polished Chrome, Satin Chrome & Black. 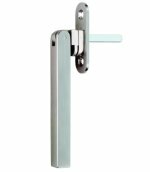 Cranked locking espagnolette window handle available in left hand and right hand handles. Size 110mm, 43mm fixing centres, 7mm spindle. 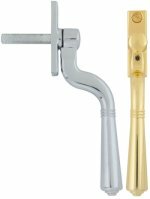 Available in Polished Brass, Florentine Bronze, Polished Chrome & Satin Chrome. Satin stainless steel square locking espagnolette window handle fastener. Size 125mm, 43mm fixing centres, 7mm spindle. 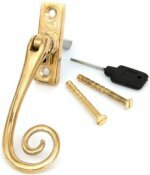 Ludlow Foundries black Iron Locking Espagnolette Fastener, available in left hand & right hand window handles. 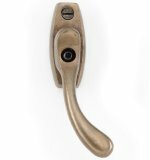 Oil rubbed solid bronze curly tail espagnolette window handle available in left hand and right hand handles. Size 43mm fixing centres, 7mm spindle. 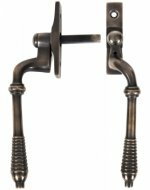 Oil rubbed solid bronze bulb espagnolette window handle available in left hand and right hand handles. Size 43mm fixing centres, 7mm spindle.